The announcement this morning from Pathfinder Minerals Plc regarding the inking of a deal between African Focus Group (“AFG”) and the company is extremely positive for shareholders on numerous counts. Firstly, as per CEO Scott Richardson-Brown’s closing comments – “I feel confident that we can move forward with them to the successful conclusion of the good faith negotiations that are progressing in Mozambique” makes abundantly clear that negotiations with Pathfinder Minerals SA (current licence holders) are (a) ongoing and (b) that the BoD is confident of a successful conclusion. Secondly, the expiry of the consultancy agreement, being 30 Sep 2019, is of a sufficiently short timescale to send a signal to shareholders that this long running issue is now within a visible horizon regarding a hoped for resolution. Thirdly, and most importantly, the comment that AFG are looking to convert their fee into equity at a multiple of the current stock price we resolutely welcome and believe sets the floor for the equity price post the conclusion of a deal. We reiterate the company update point that this fee is only paid on completion of the transfer of the licence back to PFP. The effect of this would be totally transformative for the company as we have highlighted numerous times, most recently HERE highlighting the potential upside from such a scenario. The cap of 9% of the equity to be made available to AFG post the return of the licences for the sum of £1m is equivalent to just over £11m pre-money – over 3 times the current stock price and in fact equivalent to 4p per share. Collectively, taking all these points together reads to us as the largest shareholders that a deal is now looking extremely likely to be brought to a conclusion in the near term. In the heavy minerals sector, there are some fairly chunky valuations. 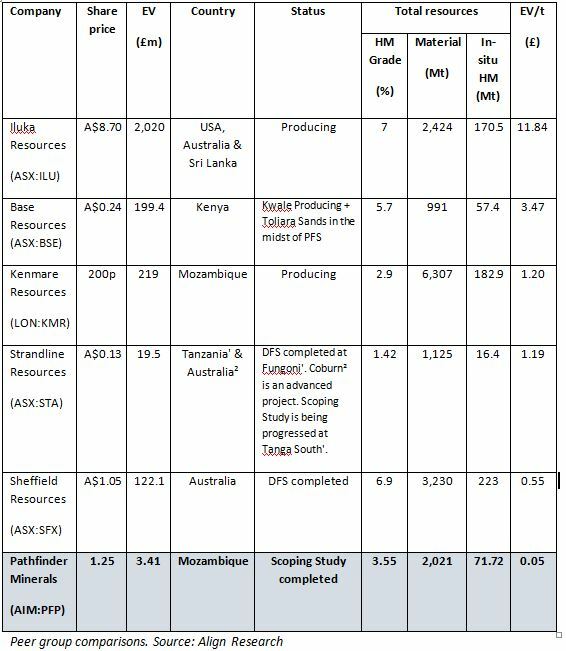 Looking at the Enterprise Value (EV) per tonne of heavy minerals resources suggests a range of valuations. The EV/t figures below illustrate how valuations can increase as a project climbs the valuation curve and moves from the DFS stage to production. Should the company be successful in the return of the licences, post the completion of the feasibility studies we believe PFP could gain a rating of £0.55 – £1.48/t for its heavy mineral sands resource, similar to that awarded to Sheffield Resources and Strandline Resources that are at similar stages. This would suggest a valuation of anywhere between £37.51 million and £100.93 million being equivalent to 13.75p – 37p (pre new money). This gives a clear indication of the prize at hand here for equity holders and illustrates succinctly why we remain the largest shareholder. There will of course be dilution in completing the deal with Pathfinder Mozambique SA and progressing the all important feasibility studies. In discussions with the Board however, we believe debt facilitation to be a realistic prospect with existing expressions of interest. With a tight float now at play in the stock and most shareholders likely waiting on the conclusion of the talks with Pathfinder Minerals SA we reiterate our Conviction Buy stance and anticipate a material re-rating as the countdown begins. Align Research & a director of Align Research own shares in Pathfinder Minerals and are bound to Align Research’s company dealing policy ensuring open and adequate disclosure. Full details can be found on our website here (“Legals”). This is a marketing communication and cannot be considered independent research. Nothing in this report should be construed as advice, an offer, or the solicitation of an offer to buy or sell securities by us. As we have no knowledge of your individual situation and circumstances the investment(s) covered may not be suitable for you. You should not make any investment decision without consulting a fully qualified financial advisor. Your capital is at risk by investing in securities and the income from them may fluctuate. Past performance is not necessarily a guide to future performance and forecasts are not a reliable indicator of future results. The marketability of some of the companies we cover is limited and you may have difficulty buying or selling in volume. Additionally, given the smaller capitalisation bias of our coverage, the companies we cover should be considered as high risk. This financial promotion has been approved by Align Research Limited.